The “obscenity” of Gareth Bale? Against Assad, against sectarian militias, against US bombs; for democracy in Syria! An Employment Tribunal has ruled that Zack Dahou, a leading trade union rep employed by Serco Barclays on the “Boris Bike” municipal cycle scheme, was unfairly dismissed and that his dismissal was linked to his trade union activities. The victory comes in the context of union advances in the workplace, with a recent strike against unilateral shift changes and bullying management securing the removal of the two worst managerial culprits and a management agreement to consider union proposals for shift patterns. Members of the Fire Brigades Union (FBU) have voted strongly for strike action over the government’s pension proposals which could see the first national firefighters’ strike for a decade. FBU members voted almost four-to-one (78%) on a 60% turnout for strike action with the next month – close to an absolutely majority of those balloted. The Communication Workers Union (CWU) has announced that it will ballot members working for Royal Mail and Parcelforce for strikes from 20 September unless Royal Mail agrees a “legally-binding” deal that guarantees to protect workers’ pay, pensions, and conditions in the event of the privatisation of the service. The ballot would be due back on 3 October, with strikes expected by 10 October if it returns a yes vote. It would be the first national ballot of CWU’s 125,000 Royal Mail members since 2009. The recent protests in Balcombe in Sussex have prompted a revival of the largely dormant climate movement in the UK. AWL members have rightly taken part in the mobilisations, which have brought local residents into an alliance with climate activists to thwart drilling efforts and stymie the Tory-led government’s “dash for gas” policy. This summer’s football transfer window was a real seller’s market. Clubs dug their heels in to keep their best contracted players, and mostly succeeded. Rooney didn’t go to Chelsea. Suarez didn’t go to Real Madrid. Rooney, Suarez, Benzema, Cabaye, and Higauin didn’t go to Arsenal. After flirting with the Occupy movement in London, I found myself swerving into the Marxist school of thought. Harvey’s book appealed because it examines the nature of the urban environment in relation to capital circulation processes and class struggle via the Marxist method, a twinning that neatly merges the latest two integers in my own political development. Bakers, Food, and Allied Workers Union (BFAWU) organiser Geoff Atkinson spoke to Solidarity. 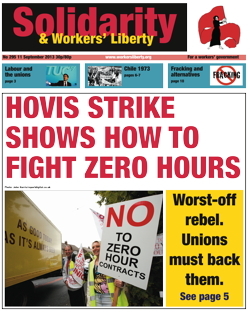 We can be an inspiration to other workers facing zero-hours contracts. Sometimes it takes a little person to stand up and fight against a big bully. We had always managed without agency labour at Hovis. In the past there was always an eight week rolling contract for temporary workers. If you worked 13 weeks, you got a permanent contract.